As the daughter of an architect, Beth was raised in an atmosphere of creativity and appreciation for all forms of artistic expression. She was a graduate of the State University of New York at Potsdam and received her Masters of Fine Arts degree from the University of Wisconsin. Over the years, she has worked as a junior high school art teacher and later as an interior designer. She has always enjoyed working with her hands whether it be creating jewelry, pottery, textile arts, or painting. The interplay of design, color, pattern, and texture has always fascinated her. There are infinite possibilities and combinations that can be created with a little imagination. Her work has won prizes at shows, been published in books and magazines, and shown in museum and gallery shows. 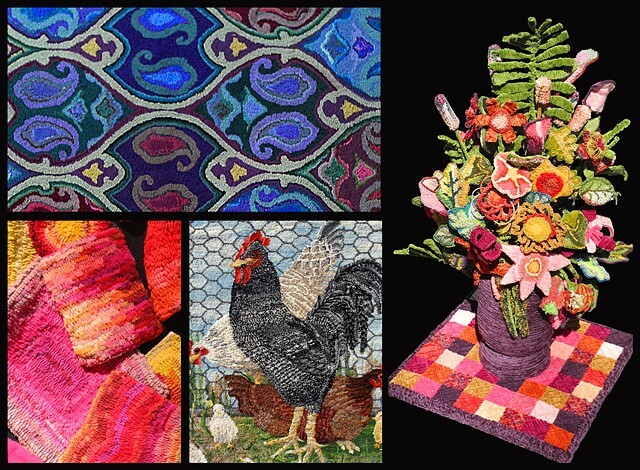 Her recent work shows a diversity of subjects, materials, and techniques that can be integrated with rug hooking in 3-dimensional form.